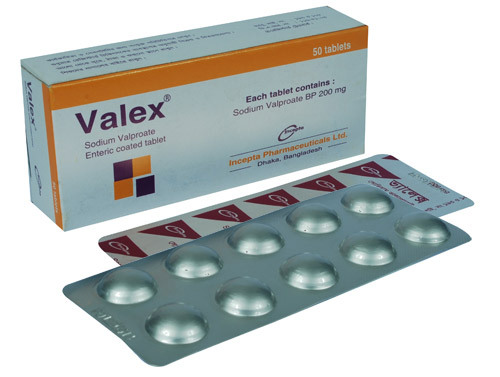 Valex tablet: Each enteric coated tablet contains Sodium Valproate BP 200 mg.
Valex Syrup: Each 5 ml syrup contains Sodium Valproate BP 200 mg. Sodium Valproate, the active ingredient of Valex is endowed with anti-epileptic activity against a variety of seizures. The mechanism by which Sodium Valproate exerts its anti-epileptic effects has not been established. However, it has been suggested that its activity is related to increased brain levels of gamma-aminobutyric acid (GABA). Valex is indicated for the treatment of all types of epilepsy, e.g. Partial seizures, Absence seizures (petit mal), Generalized tonic-clonic seizures (grand mal), Myoclonic seizures, Atonic seizures, Mixed seizures that include absence attack, Prophylaxis of febrile convulsion, Prophylaxis of post-traumatic epilepsy. It is also indicated in the treatment of bipolar disorder & prophylaxis of migraine. 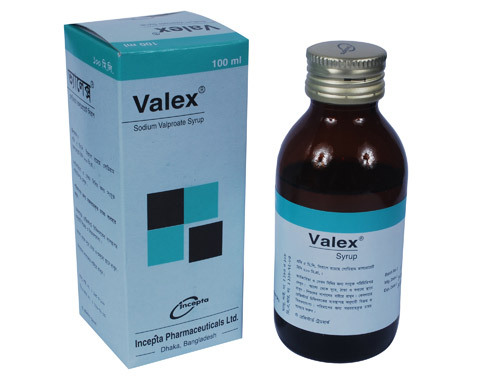 Valex CR is a prolong release formulation of sodium Valproate, thus Valex CR may be given once or twice daily. 2.5 g daily in divided doses until control of seizure is achieved. Usual maintenance dose is 1-2 g daily (20-30 mg/kg daily). Children Initially 20 mg/kg daily in divided doses, may be increased (up to 20 kg) provided plasma concentrations monitored (above 40 mg/kg daily also monitor clinical chemistry and hematological parameters). Children Initially 400 mg daily in divided doses increased until control (0ver 20 kg) (usually in the range of 20-30 mg/kg daily); Maximum 35 mg/kg daily. Febrile convulsion 20-30 mg/kg/day in 3 divided doses. Bipolar disorder Initially 20-30 mg/kg/day in 2-3 divided doses; adjust dosage in 3-5 days. Maintenance dosage is 1000-2000 mg/day. Prophylaxis of 300 mg twice daily, although some may require 1000 mg daily. The most common side effects are anorexia, nausea and vomiting. However, these side effects are minimized with the use of enteric coated tablets. Effects on the CNS include sedation, ataxia and tremor. These symptoms occur infrequently and usually respond to a decrease in doses. Rash, alopecia and stimulation of appetite have been observed occasionally. Sodium Valproate has several effects on hepatic function of which elevation of liver enzymes in plasma is observed in up to 40% of patients and often occurs asymptomatically during the first few months of therapy. Rarely a fulminate hepatitis that may be fatal may develop. Children below 2 years of age with other medical conditions and those being treated with multiple antiepileptic agents are specially prone to suffer from hepatic injury, acute pancreatitis and hyperammonemia have also been frequently associated with the use of Sodium Valproate. Liver functions should be monitored before therapy and during first 6 months especially in patients most at risk, No undue potential for bleeding before starting and before major surgery must be ensured, Care should be taken in renal impairment, pregnancy, breast-feeding and systemic lupus erythematosus. Sodium Valproate is partially eliminated in the urine as a ketone metabolite, which may lead to a false interpretation of the urine ketone test. Sudden withdrawal of therapy should be avoided. Sodium Valproate crosses the placenta and in humans, exposure to valproate in the first trimester has been associated with neural tube defects such as anencephaly and spina bifida in newborn. Pregnant women treated with Valex should be offered to estimate serum a-fetoprotein. Valex is excreted in breast milk. However, breast-feeding by a mother taking Valex probably causes no risk to the child.